It is with great sadness that we announce the cancellation of the entire April/May 2010 North American tour for King Sunny Ade and his African Beats. 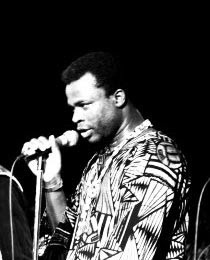 On March 26th 2010 a tragic car accident took the lives of two members of the African Beats, talking drummer Gabriel Ayanniyi and percussionist Omo Olope, who were en-route to a video shoot for a forthcoming recording. When the US Embassy refused to grant visas to replacement members in a timely manner, there was confusion about the possible courses of action.At the same time, it became clear that the artist and the band had neither recovered from the impact of the tragedy, nor were they able to find consensus on how to move forward with normal touring. As a result, the North American April/May 2010 tour has been canceled until such a time as King Sunny Ade and his group have sufficiently regrouped and are ready to face the rigors of an International tour again. We offer our heartfelt condolences to the band and the families of the deceased. On behalf of the artist and his band we extend our apologies to all who will be disappointed by their inability to perform in North America this year.